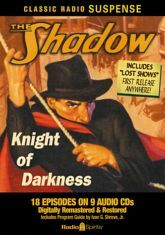 Radio Spirits is very pleased to present radio's greatest crime fighter, The Shadow, in this new collection of eighteen digitally restored and remastered episodes selected from the classic series. Featuring Orson Welles, William Johnstone and Bret Morrison each in the title role, this set also includes the first release of two newly discovered and previously lost episodes starring Orson Welles as Lamont Cranston and The Shadow - "The Old People" and "The Voice of the Trumpet". Also starring in this collection are Margot Stevenson, Agnes Moorehead, Marjorie Andersen and Grace Matthews as The Shadow's lovely companion Margot Lane, and a supporting cast including Kenny Delmar, Alan Reed, Everett Sloane and more! One of the 20th century's most iconic fictional characters, listen to the sinister laugh and discover "Who knows what evil lurks in the hearts of men?" Included in this collection is a Program Guide by radio historian Ivan G. Shreve, Jr. with photographs and background information about the shows.